In 1912 French chemist Louis-Camille Maillard, heated sugar and amino acids in an experiment. The reaction turned out to be a shortcut to create meat flavour and aroma. This chemical reaction has thus been called Maillard Reaction or Browning Reaction. Extensive research on the Maillard Reaction has been conducted across diverse fields including food, nutrition and therapeutics. The term Advanced Glycation Endproducts (AGEs) was introduced as a result of this research. The term is used to describe the end products of the Maillard Reaction that are formed in living organisms under normal physiological conditions. AGEs are also externally formed by the heating of food. These are then taken up by the body when this food is ingested. Examples of food with very high level of AGEs are cola and creme brulee. Another source of AGEs intake is due to smoking. Until now it has been complicated to measure tissue AGEs in patients because existing methods are expensive, time consuming, lack specificity, are poorly reproducible and/or are invasive. The AGE Reader is the answer to the need for measuring AGEs without the disadvantages of the existing methods. 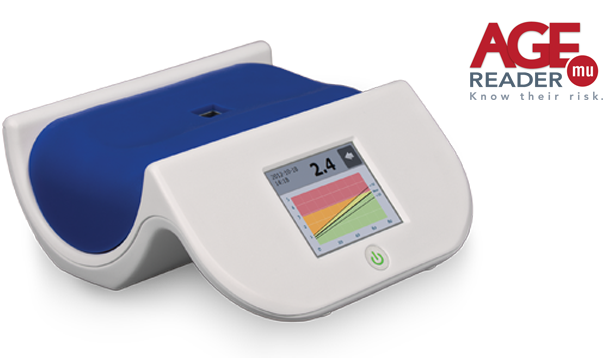 This state of art device provides a simple non-invasive solution which allows clinicians to determine the AGE level within 12 seconds. Many AGEs have a characteristic fluorescence. Moreover, tissue fluorescence in (invasive) biopsies has an established association with chronic complications. The AGE Reader is able to easily, quickly and noninvasively measure this tissue fluorescence.